The monument test is an obligatory part of the modern history of Ukrainian cities. Some cannot say goodbye to the petrified Soviet past, and others struggle with erecting pro-Ukrainian monuments. Poltava is no exception. This city is often called the cultural capital of Ukraine, due to its rich history and many famous Ukrainians born here. However, there is a second side to this coin, which the city received from Peter the Great after the famous Battle of Poltava in 1709. Following the imperial ideological concept, Poltava was dubbed a “city of Russian military glory.” This is vividly emphasized by the Glory Monument, erected in the heart of the city. Ukraine has been independent for almost a quarter of a century, but no pro-Ukrainian monument to Mazepa, a bitter enemy of Peter and all supporters of the Russian Empire, has appeared in Poltava so far. “Whatever people say, we should focus on historical truth. 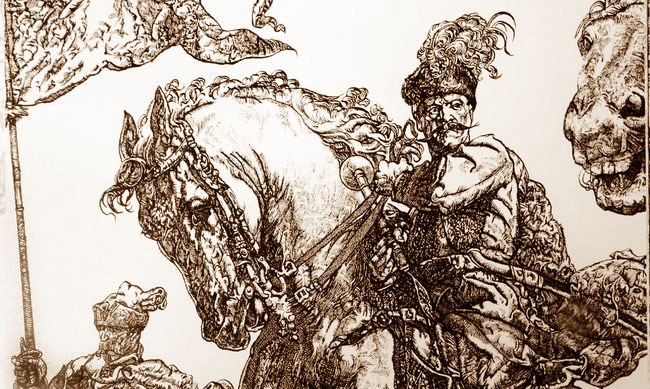 Who was Hetman Mazepa for Ukraine? He was a champion of our independence. Mazepa, by the way, never visited the historic quarter of modern Poltava. However, many shrines in historic Poltava region were constructed at his expense. They include the Ascension Cathedral in Pereiaslav and the Transfiguration Cathedral in the Mhar Monastery near the town of Lubny. Mazepa was the founder of the Monastery of the Exaltation of Holy Cross and the Holy Dormition Cathedral, both located in Poltava. Having never visited the urban fortress of Poltava, he did visit historic Poltava region. Without a doubt, a monument to Mazepa deserves to be in the historic quarter of Poltava, that is, on the site of the former fortress of Poltava,” noted Liudmyla Shendyk, deputy director for research at the Poltava Battlefield Reserve. The saga of the monument to the hetman has gone on for almost a decade. And it seems, the long standoff is coming to an end. The Poltava City Council made a historic decision on February 25 by voting in favor of the monument. Still, we should not celebrate victory until the monument graces Poltava’s Soborna Square. When can it happen? The situation is complicated. Let us recall the events of October 14, 2015. It was on that day, the feast of Ukrainian Cossacks and the Holy Virgin’s Intercession, that citizens of Poltava saw the monument to the hetman coming to their city for the first time. It was rumored that the monument was to be erected very soon, immediately after its official presentation... But nothing has happened. Where the sculpture was before? It was gathering dust in Kyiv, even though it had to be erected in Poltava back in 2009. We probably need a little digression into the past here, to retell previous series of this dramatically absurd saga. Now, people have been trying to implement the idea of a monument to Mazepa in Poltava since the mid-2000s. The initiator was chairman of the Poltava Regional Association of the Prosvita All-Ukrainian Society Mykola Kulchynsky. The idea received support from the then president Viktor Yushchenko somewhat later, in 2007, and he issued a decree to that effect. Thus, a monument to Mazepa was to be erected in 2009 to mark the 300th anniversary of the Battle of Poltava. The city council also gave the green light to this idea then. The central government allocated 1.5 million hryvnias to the regional budget, but the Poltava Oblast Council voted to reject this funding as unnecessary in 2008. Nevertheless, the sculpture was made in time, funded by donations gathered by Prosvita’s Poltava branch. Still, the monument was not erected in 2009 because of opposition from the then mayor Andrii Matkovsky. Next mayor Oleksandr Mamai also opposed the idea. Opposition of the city council was precisely the reason why the sculpture sat idle all these years on the premises of the Khudozhnyk factory in Kyiv. Criminals have even started to plunder the monument, including by taking off its bronze buttons. Some progress has been made on the issue in recent years. The Revolution of Dignity and the war in eastern Ukraine have shaken up the community and prompted a growing outrage. Eventually, the monument was brought to Poltava on the Defender of Ukraine Day and presented to the public. Its erection was still subject to the local authority’s permission. Even though the most recent local election in Poltava left the previous mayor in his chair, it did renew the composition of the city council. In particular, representatives of the new young generation won a few seats. One of the initiators of the decision to erect the monument to Mazepa was Vadym Yamshchykov, deputy head of the council committee on urban planning, architecture, and municipal enterprises’ development. “The struggle for the monument to Mazepa in Poltava was started by the Prosvita. This struggle was passed from generation to generation. And now we, the young people were able to complete what our elders worked out. They started this process, and we have ended it,” young member of the Poltava City Council Yamshchykov summed up. It should be noted that the decision was not easy for Poltava councilors. Mayor Mamai reiterated that he would abstain in the vote on the monument to Mazepa, as he believed it to be “a divisive political issue for the community.” He also made sure to remind those present that he was born in the Soviet Union, and was taught throughout his life that the hetman was a “traitor.” After a prolonged discussion and debate, councilors finally made their choice, casting 28 votes in favor of the historic decision. “Time puts everything in its place, prompting people to make the right decisions. Some of those who voted ‘yeah’ had been among those opposing the monument’s erection before. But time has passed and the country has changed. This council is more mature than its predecessors. As a result, we have the long-awaited positive decision on the monument to Mazepa,” concluded Kulchynsky, chairman of the Poltava Regional Association of the Prosvita All-Ukrainian Society.